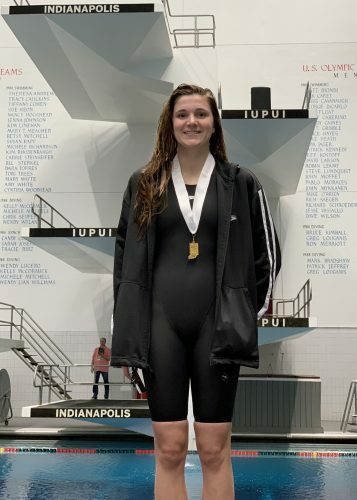 INDIANAPOLIS – The Northern Lakes Conference had lots to celebrate after the conclusion of the IHSAA Girls Swimming State Finals Saturday afternoon at the IUPUI Natatorium. Warsaw saw a little history Saturday with its lone swim. Senior Delaney Wihebrink became the highest-finishing swimmer in program history when she placed third in the breaststroke with a time of 1:03.06. Wihebrink had a slight edge on St. Joe’s Aislynn Walsh after about 60 yards of the final, both chasing after defending champion Emily Weiss of Yorktown. As Weiss pulled away in the third leg toward a 58.91 championship, her fourth title to sweep her career in the breaststroke in Indianapolis, Walsh and Wihebrink were in a near dead heat at the final turn. Walsh’s push off the last wall gave her a slight edge, and while Wihebrink made a hard charge in the final few strokes, Walsh posted at 1:02.56 to Wihebrink’s 1:03.06. The time bested her previous school record of 1:03.45 set the night before in the prelims. Northridge’s Elsa Fretz won the state title in the 50 freestyle, blazing to a 22.88 championship, her first individual title. Fretz nearly added a second later in the 100 freestyle, going 50.12 to fall just shy of Hobart’s Emma Wright at 49.95. A Fretz-led 200 and 400 free relays both landed in fourth place, the 200 at 1:34.74 and 400 at 3:28.51. Ridge had Haley Dygert finish seventh in the breaststroke and 14th in the individual medley, Jenna Nethercutt take sixth in the breaststroke, the medley relay win the consolation race, and divers Jiselle Miller and Kaitlin Simons place eighth and ninth in the final standings. All told, the Raiders placed fifth in the team standings with 163 points, only 3.5 back of runner-up Franklin Community’s 167.5 and just behind Fort Wayne Carroll and former head coach Joe Keller and his Fishers squad, which tied for third at 165. Fellow NLC member Concord also had representation in championship pushes. Freshman Grace Brenneman had a debut to remember, placing fifth in the 100 freestyle and eighth in the 200 freestyle, and anchored both the 200 and 400 relays to 11th and 16th place finishes. Culver Academy’s Autumn Baumgartner placed 10th in the 50 free and 13th in the 100 free. South Bend St. Joe’s Mary Catherine Pruitt added an area title with a 4:49.42 championship in the 500 freestyle. 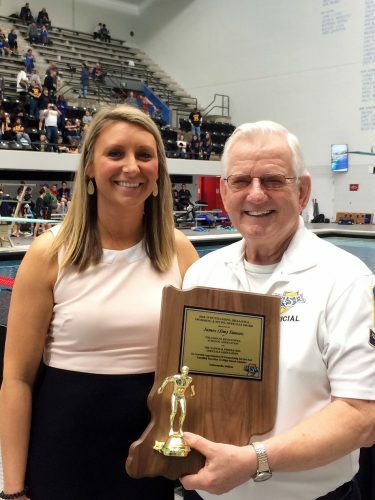 Carmel won its 33rd straight team championship with another overwhelming set of results, scoring 413 points on the strength of three relay titles and six wins overall along with a slew of top-eight placings.